The mast is on a tabernacle and can be lowered to cruise mast down. Hot/Cold pressurised water to the heads/shower, cold water to the galley. This is a nice example of the Tom Lack 9m catamaran, converted to a single inboard engine, from its' original twin-engine configuration. With loads of crew space as well as storage, across 4 cabins, as well as full heads and galley, there is accommodation for up to seven people. Benefitting from a dog-house as well, the boat can be sailed in all weathers. She has a fairly recent survey and many items have been completed by the Owners already. Sadly, ill-health forces a sale before they've had the chance to fully complete the refurb. The berth may be available but would be subject to a berth transfer fee of 5% of sale value, payable directly to the marina. 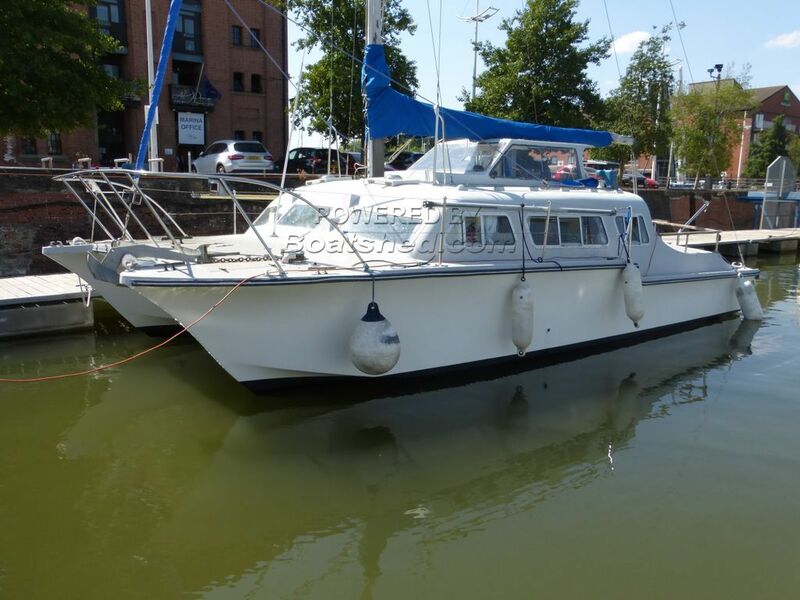 This Catalac 9m has been personally photographed and viewed by Paul Watson of Boatshed Yorkshire. Click here for contact details. Yes, she is still available. Hi....is this catamarán still available??? ?